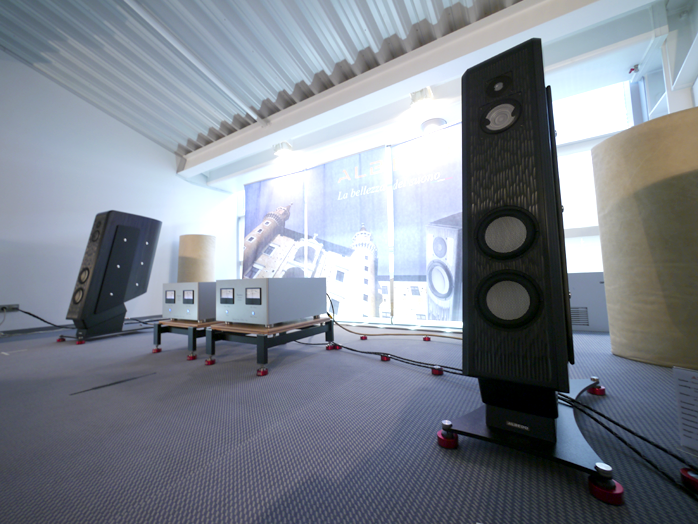 From my Munich HighEnd 2014 show report, "... unlike in years past, Albedo Audio had vacated the static display concept on the ground floor to brave the big upstairs world of active demos with all the risks and DJing this entails. Now I had a chance to hear designer Massimo Costa's big 3-way floorstanders run off massive Italian valve amps. This confirmed it once again. When it comes to Thiele & Partners aka Accuton drivers, Albedo might be my favorite brand. I'm still sad to have let their smaller review loaners go back to Italy. At the end of the day of course there are only so many pairs a reviewer can own before the question on where to store them all can no longer be answered. That said, if I divested myself of one really big tower in standby in my entry hall, I'd be very tempted to reacquaint myself with their small pair. 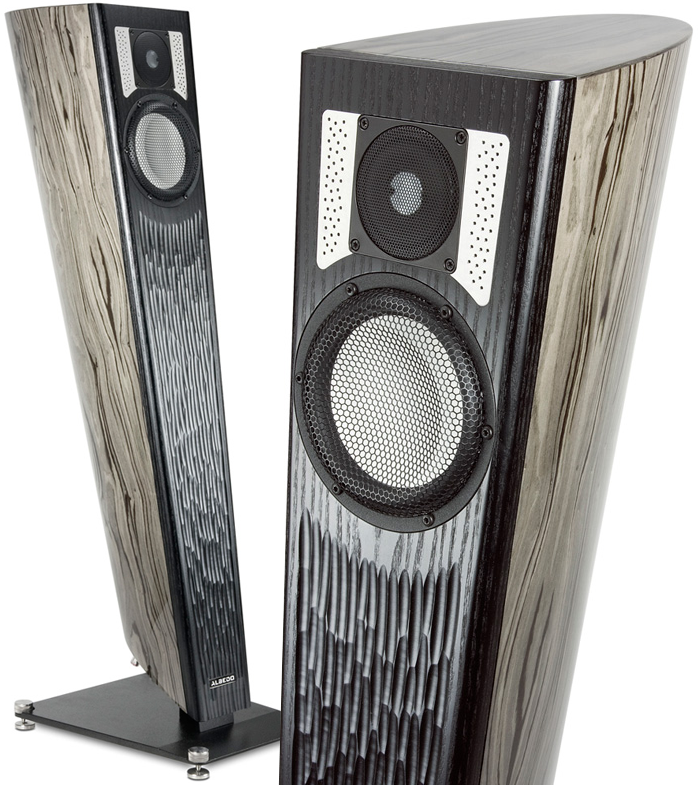 That was one shocking performer most ideally driven by my 60wpc Crayon Audio CFA-1.2." 2014 Munich showing with Albedo's 3-way Axcentia. To rub salt into that wound, there was Bryan Perrin's email: "Just a quick email to say that I enjoyed your Munich show report. I also wanted to say that I do not share your regret of you not purchasing but returning to Italy the Albedo Aptica loaners as mentioned in your report. My reason? I was lucky enough to buy those at an excellent price. I ended up driving them with the Gato DIA250 which I am very happy with but will always regret not being able to hear them with the Crayon integrated." 12 years into my reviewing gig for these pages, my speaker journey had led me to an unavoidable if very back-happy realsization. My best results now came from small high-quality 2-ways with perhaps <40Hz assist from my big Zu Submission subwoofer. Think German Physiks HRS-120 full-range omni two-way completing our upstairs 2-channel movie system; Gallo Strada II with TR-3D sub on my desktop. In the main rig I'd whittled down speaker mates to Martin Gateley's soundkaos Wave 40 to accompany my 10-watt SIT1 monos; and Sven Boenicke's tiny W5se to dance with the Goldmund/Job 225. My big 5-driver 3-ways from Lithuania had sold to a gentleman in Serbia. What I now wanted to round out my transducer options was a modern ultra-resolution monitor. It'd represent a rather different kind of sound. 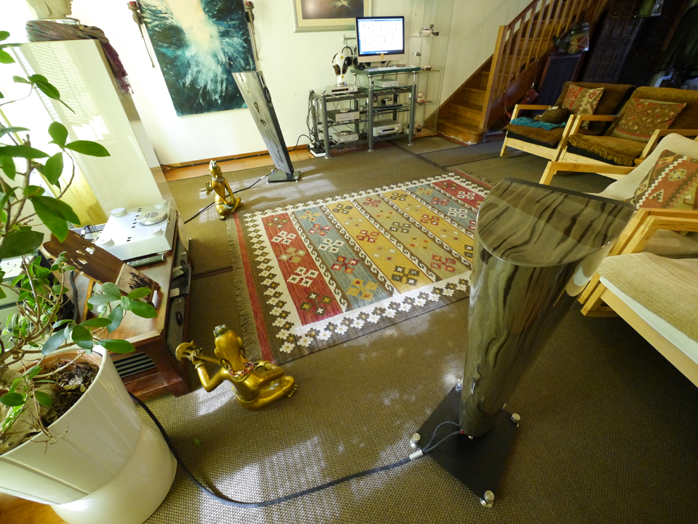 Reviewing the $14'690/pr EnigmAcoustics Mythology M1 earlier in the year had very persuasively made that case. It had demonstrated the usefulness of extreme detail magnification to zoom into very small differences of review gear. When your ears give out, crank up the res. My existing speaker lot majored on tone and textures. 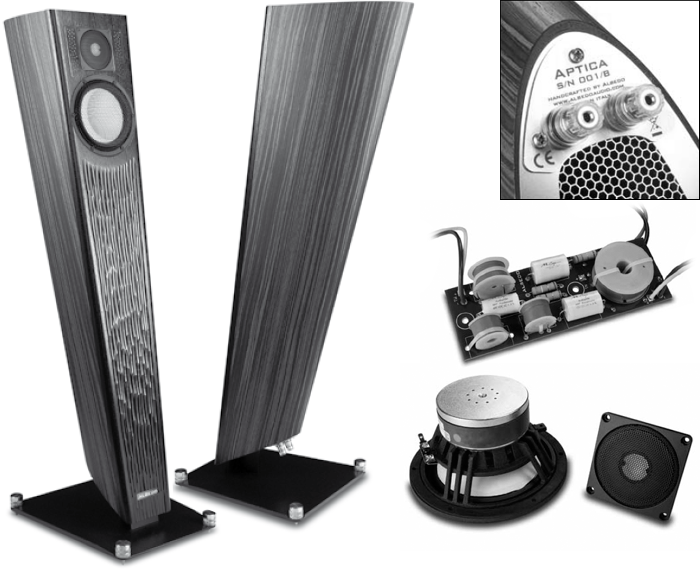 The M1-type sound had been about maximum aeration, ambient recovery and micro detail. In short, modern ultra fi. Crayon and Albedo in our prior Villeneuve flat.